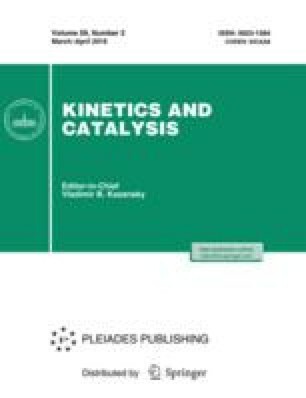 The kinetics and mechanism of the action of tetra- and octanuclear ruthenium catalysts for water oxidation with Ce(IV) compounds in “artificial photosynthesis” have been studied. These catalysts are formed from a complex K4[Ru2(SO4)2(μ-SO4)2(μ-O)2] · 2H2O in an acidic medium via its self-organization. A tetranuclear adamantane-like cluster Ru4O6 is obtained during the dimerization of a binuclear complex and catalyzes the four-electron water oxidation to an oxygen molecule. An octanuclear cluster Ru8O12 is formed during the tetramerization of a binuclear complex and catalyzes the eight-electron water oxidation to an oxozone molecule O4, which readily splits to two oxygen molecules. Original Russian Text © Z.M. Dzhabieva, M.L. Temnova, T.S. Dzhabiev, 2018, published in Kinetika i Kataliz, 2018, Vol. 59, No. 2, pp. 155–159.